San Juan County is named after San Juan Island, which was named after St. John the Baptist (San Juan Bautista) by its European discoverer, Spanish explorer Francisco de Eliza, in 1791. As of 2017, the estimated population was 16,715. The county seat is at Friday Harbor on San Juan Island, which is also the county's largest city. 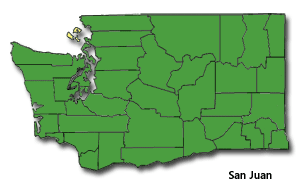 San Juan County was created out of Whatcom County on October 31, 1873. It is the smallest of Washington's 39 counties in land area, but has more shoreline than any other county in the state. The County comprises a total land mass of 175 square miles and is a cluster of approximately 200 islands (172 of which are named). The main ones are San Juan, Orcas, Lopez, and Shaw Islands. It has rugged mountainous terrain that is both steep and rocky. The highest point in the county is Mount Constitution on Orcas Island at 2,407 feet (734 meters) above sea level. 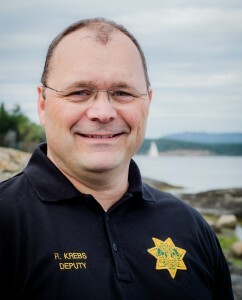 The Sheriff's Office is the only law enforcement agency in the county. As an interesting note, there are no traffic signals in the entire county. According to the U.S. Census Bureau, the county has a total area of 621 square miles. Of this, 175 square miles of it is land and 446 square miles of it (71.84%) is water. The population density is 80 per mile.